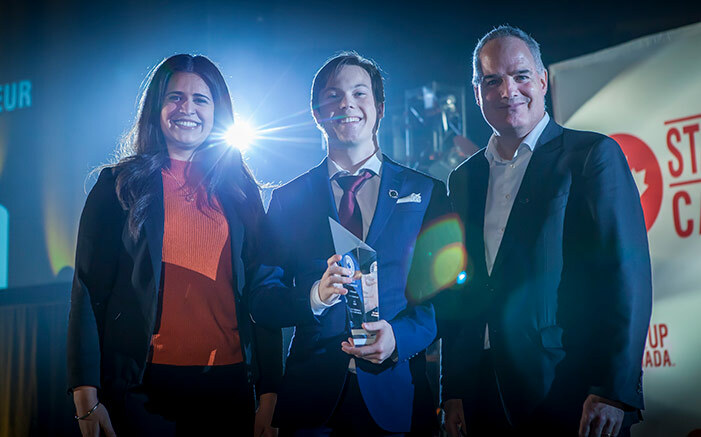 Less than two years after launching a business that pairs students with odd jobs in the community, Cameron Ritchie is now Startup Canada’s young entrepreneur of the year. HomeWurk, founded by Mr. Ritchie when he was in Grade 11, allows students looking for work to take on odd jobs for local residents who may not have the time or ability to complete them. Students choose the jobs they’d like to do, allowing for flexibility in their schedules. Mr. Ritchie, a first-year engineering student at UNB Fredericton, received the award in Ottawa on Oct. 18. He had the opportunity of a lifetime to speak to the hundreds of business and government leaders in the room and the thousands watching via livestream. He also had the opportunity to talk with other business leaders, including businessman and former “Dragon” Brett Wilson and the Minister of Small Business and Export Promotion, Mary Ng, who requested a meeting with Mr. Ritchie. Mr. Ritchie received the Atlantic Canada Startup award in July and has won several pitch competitions in the past 18 months, which provided initial funding for the business. Individuals and communities easily connected with the idea because how simple and relatable the concept is. Now that HomeWurk has proven wildly successful in Fredericton, it will soon be expanding to Saint John and Moncton. Mr. Ritchie is looking for student ambassadors with community connections to make HomeWurk successful in those cities. Photo: Cameron Ritchie, centre, with Christine Guyot and Francois Lecavalier from the Business Development Bank of Canada. Credit: Startup Canada.